Montefiore's Surgical Services Care Center is using exciting new technologies in the liver tumor, kidney and liver transplant, bariatric and minimally invasive surgery programs. Our onsite surgical nursing program offers continuing education credits and opportunities to develop surgical skills in many specialty areas, such as the Montefiore Einstein Center for Heart and Vascular Care. We encourage our highly skilled pre-, intra- and postoperative nurses to continually develop their skills in the latest clinical procedures. Registered nurses, nurses' aides, a case manager and support staff provide care to patients who require acute rehabilitation following surgery, a cerebrovascular accident (CVA), or knee or open-heart surgery, or who have been referred from other hospitals. This collaborative service integrates nursing care with physical, occupational and speech therapy. Patient assessment, based on individual comprehensive care plans, includes the involvement of the family or significant caregiver. Nurses also help educate patients to restore maximum independent function, self-direct rehabilitation and improve quality of life. Montefiore's Hospice and Palliative Care programs support and advocate for patients and families during the transition from the aggressive treatment phase to the end-of-life phase. Montefiore understands the powerful impact women have on the health of the family. At Montefiore, nursing incorporates the full spectrum of care for women at every stage of their lives. Our nurses provide expertise in all aspects of obstetrics and gynecology, including gynecologic oncology and pre- and postmenopausal care. The full spectrum of neonatal and pediatric care is provided within the Montefiore system. The nursing team of The Children's Hospital at Montefiore seeks nursing professionals who recognize that children do best when nurses partner with families to educate and collaborate in care delivery. The Montefiore Einstein Center for Heart and Vascular Care has a team of highly skilled and experienced cardiovascular nurses whose expertise includes understanding of the most current developments in cardiovascular intervention, electrophysiology studies, coronary care, telemetry services and cardiothoracic surgery. They also work in the most technologically advanced cardiac catheterization laboratories. Because Montefiore provides multidisciplinary care to our heart and vascular patients, our nurses have many opportunities to expand their skills. Notably, Montefiore’s groundbreaking clinical research and transplant programs augment the clinical excellence of our cardiothoracic nurses. Research nurses participate in cutting-edge clinical trials, including studies on thrombolysis in myocardial infarction, platelet receptor inhibition in ischemic syndrome management, and anti-arrhythmics versus implantable defibrillators. Over 100,000 patients are treated annually in the Emergency Department (ED) at Montefiore's Moses Campus, while Einstein’s ED has about 72,000 patient visits. The Pediatric ED in CHAM sees over 58,000. Meanwhile, the Wakefield ED has over 59,000 visits. A freestanding emergency department at the Westchester Square has also recently opened. Moses is a Level II 911 Certified Center; an application for 911 status is under way for the Einstein Hospital. 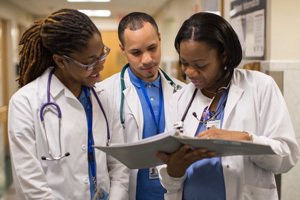 More than 400 RNs, LPNs, PCTs/EDTs and NAs work at Montefiore's Emergency Department. Montefiore nurses provide high-level emergency care for the full spectrum of patients with the innovation, compassion and collaboration that is so critical in the demanding, highly charged atmosphere of an urban emergency department. Our nurses serve as patient advocates and provide substantial education in both acute and chronic care to those released from emergency services to return home.